Blues so desperate to fix power play, so why not ask The Great One? Though there's been a downward trend from month to month so far, the Blues still rank sixth in the NHL in power-play percentage, converting 22 percent of the time. ST. LOUIS — St. Louis Blues coach Ken Hitchcock had a visitor following practice on Friday afternoon at Scottrade Center that delayed his usual meeting with the media. Hitchcock spent some time post-practice with Wayne Gretzky and when he met with the media, he apologized for the delay and joked that was getting some power play tips from the NHL’s all-time leading scorer. The coach was kidding, of course, but it might not be a bad idea to ask The Great One for some advice on the subject. The Blues’ proficiency on the power play was a key component to their hot start this season, as they scored 12 power-play goals in their first 11 games, winning eight of those contests. But lately, however, it’s been more of a power outage on the advantage for the Blues (24-7-5, 53 points), who host the Chicago Blackhawks (26-7-6, 58 points) on Saturday night. That raises some questions, if not genuine concerns, about what has happened to the Blues’ mojo on the power play. "The last two games we’ve been trying to get back on track," Blues center Derek Roy says. "I know we talked about it. We thought that maybe if we just keep working and try to even work a little bit harder then things will happen. Being consistent night in and night out and making passes on the tape and making sure that pucks are getting through — all the little things that are going to make you be successful — you have to do that every night." The Blues executed on an NHL-best 28.2 percent of their power play chances in 10 games in October, then converted 22 percent (eighth in the NHL) in 15 games in November and 16.3 percent in their 15 games this December (15th). In their 24 wins, the Blues have scored on 27.8 percent of their power play opportunities (25 goals in 90 chances). In their 12 losses, counting both regulation and overtime, the Blues have scored on just 9.5 percent of their power play chances (four goals in 42 opportunities). In seven regulation losses, the number drops to 6.7 percent (two goals in 30 chances). By comparison, the Washington Capitals, who lead the NHL in power-play percentage at 25.9, have converted 31.9 percent in their 19 wins and 19.4 percent in their losses (both regulation and overtime). St. Louis recently went three games — against Ottawa, San Jose and Montreal — without scoring on the power play, which was its longest streak of the season. If you add in the previous four games, the Blues scored on just two of 25 power-play opportunities. St. Louis went 4-2-1 in those seven games. But they have scored power-play goals in their last two games, at Edmonton and Calgary, even without a consistent presence from leading scorer and key power-play contributor Alexander Steen. 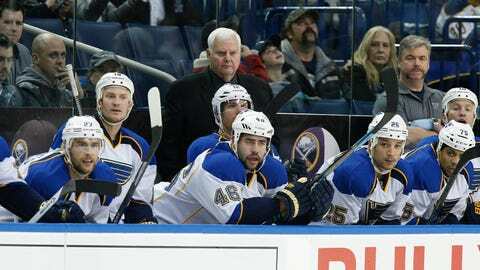 Is that a sign that St. Louis has figured something out on the power play? Maybe we’ll find out against the Blackhawks. But it’s certainly something to watch going forward, just like the slow starts. Though there’s been a downward trend from month to month so far, the Blues still rank sixth in the NHL in power-play percentage, converting 22 percent of their opportunities with the advantage. They’ve certainly got the personnel to be productive. David Backes has a team-high six power-play goals, while Steen has five and Roy and Vladimir Tarasenko each have four. Defenseman Kevin Shattenkirk leads the Blues with 11 assists on the power play, followed by Roy with nine and defensemen Jay Bouwmeester and Alex Pietrangelo each with seven. "It’s about being consistent, I think," Roy says. "If you want to be good on the power play throughout the season, you can’t score 10 goals in 10 games and then shut it down for 20. You have to stay consistent and stay consistent not just scoring goals but getting chances. If you want to score goals and get points in the league you have to be consistent every night on what you do. You can go a game with five chances without scoring but at least you’re creating offense and creating chances on the power play. We have to get back to creating that chance. We can’t just look for a lucky bounce, we have to create it." Or ask Gretzky for some tips.